We are located at 86 Registration Drive Cartersville, GA 30121. 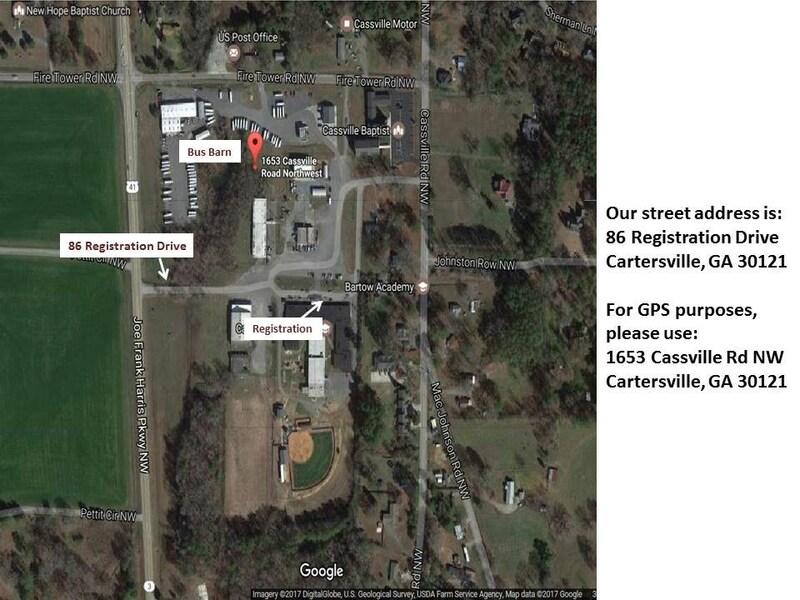 For GPS purposes, please use 1653 Cassville Road NW Cartersville, GA 30121. In order to attend a school in the Bartow County School System, new students and their families must complete a Two-Step Process. Step 1 – Registration: Parent/guardians must visit the Central Registration Office and bring a copy of all required documentation. It is recommended that parents complete the registration packet prior to their visit to expedite the process. The family will register all school-aged children during this one visit. Step 2 – Enrollment: Parents/guardians and students will visit the assigned school to enroll and obtain class assignments, schedules and other information unique to the school. Please note: Due to the high volume of enrollments during the first 2 weeks of school, there may be at least a 48-hour enrollment processing time. Note: Students transferring from one Bartow County School to another do not need to register through Central Registration. Normal Business hours are Monday-Friday 8:00 a.m. - 4:00 p.m. Our phone number is (770) 606-5175. Early registration for the school year 2019-2020 will be from May 28, 2019 to June 6, 2019. Please refer to the Required Documents for Student Registration link below for necessary documents to bring for registration.